The holidays are a time of great anticipation as we plan family gatherings, buy gifts and celebrate the season. Although it is supposed to be a time of joy, sometimes there are some unexpected feelings of stress and depression that interfere with plans. As we jump into this busy season, here are a few ways to control and cope with holiday stress and depression. Keep your holiday plans realistic. You don’t have to have the perfect tree, serve the perfect meal and give the perfect gift. Not everyone will be joy filled and you can’t grant everyone’s wish. Instead, resolve to do the best you can, which may mean saying “no” to some requests like organizing the office holiday party. Remember that life changes and you may not be able to do the same things that you did in the past. If your adult children can’t be there on Christmas morning, find new ways to connect with them. Instead of longing for what used to be, find new ways to celebrate with friends and family. With brimming buffets, bountiful cookie platters and tempting hot toddies, it is easy to forget about your health. Overindulgence can bring on feelings of guilt as well as illness. Enjoy your favorite foods and beverages in moderation. Take breaks from holiday shopping, preparations and partying. Get a good night’s sleep and work a little exercise into your schedule. Staying healthy makes it easier to enjoy holiday fun. One of the big seasonal stressors is being unprepared. To avoid running out of flour during cookie baking, make a shopping list before you begin. Figure out which things are most important and plan time to make them happen. Set a budget and stick to it so overspending doesn’t bring on additional stress. 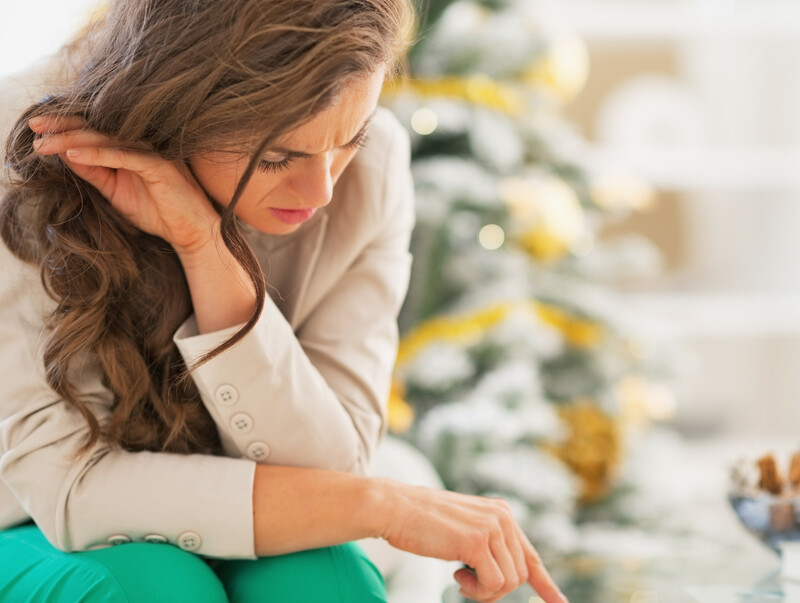 Having a realistic plan can provide a feeling of calm that overrides the usual holiday stress. And don’t forget to delegate if there are too many tasks to be done. It is okay to ask someone else to make the sweet potatoes this year and line up some relatives to help with the dishes after dinner. If you have lost a loved one or can’t be with family, it is normal to feel sadness. Instead of ignoring that grief, allow a time to experience the loss. Many churches hold special Blue Christmas services on or around Dec. 21, the longest night of the year, to remember lost loved ones. Consider attending one of these services or simply find a time to express your feelings. Sometimes it is best to realize that life is not perfect, shed a tear and then move on. For some, the holidays are a challenge due to medical issues. The desire to bake, decorate and visit with family is there but the ability to do these activities is affected by a recent illness or medical event. But that doesn’t mean that the holidays can’t be enjoyed at all. Spending the holidays at a short-term care rehabilitation facility, such as Glenview Terrace, is a way to be sure you receive the proper care you need while still partaking in holiday decorations, foods and events. Guests at Glenview Terrace can stay warm and cozy while enjoying wonderful meals and delighting in the decorations put up for residents. Family can come visit in one of the comfortable lobby areas and you can also enjoy a dinner together. Your family and friends can be assured that you are receiving excellent medical care — even during the holidays — which can help them rest easier as well. A stay at Glenview Terrace at any time of the year is always a positive step toward recovery. Guests who choose to stay at Glenview Terrace will have access to board-certified medical directors and physicians from local hospitals to ensure continuity of care. Top therapists provide personalized, one-on-one physical, occupational, speech and respiratory therapies to help you quickly and thoroughly recover. A nurse practitioner is on-site to work directly with your physician to help quickly diagnose and manage your medical needs. Also, a rehabilitation nursing manager will guide your nursing team so you can reach the best possible outcome while the director of therapy oversees your therapy goals. With a five-star Medicare rating, Glenview Terrace delivers this top-notch care in an elegant setting that begins with beautifully landscaped grounds and continues into the spacious, well-appointed rooms. Guests can enjoy nutritious meals served in elegant dining areas or in their rooms. There are many opportunities for interaction with others during planned activities. Guests can also choose to relax in their rooms with a stunning array of amenities and services to pamper them. No matter what the season, you can be sure of receiving the best medical care in elegant surroundings. For additional information or to arrange a tour, visit glenviewterrace.com or call 847-729-9090.